Only thirty years ago, Kowloon Walled City was the most densely populated area on earth. After becoming unmanageable in the early 1990s it was razed, and the area is now a Chinese garden. Image: Daryl Chapman via flickr. Image by http://forgemind.net/ via Flickr. Kowloon Walled City became one of the most densely populated places in the world between the 1950s and the 1990s, and was aptly named the ‘City of Darkness’. It housed 50,000 people in a 2.6-hectare block, equating to approximately 4sqm of living space per resident. From the 1950s to mid-1970s ‘The City of Darkness’ was overseen by Chinese Triads. Fugitives, criminals, brothels, casinos, cocaine parlours and opium dens were prolific throughout the lawless city. It was also a haven for unlicensed doctors, dentists and restaurateurs wishing to continue operating while avoiding laws and safety standards. The labyrinth of dark passageways and interconnecting buildings meant the area was rife with drug trafficking and prostitution. The Walled City dates from the Song dynasty (960 AD-1279 AD), and was originally used by the Chinese military to manage salt production and for defence against pirates. In 1898, it came under British rule when England leased Hong Kong from the Chinese. During World War II, the Japanese invaded Hong Kong eight hours after the attack on Pearl Harbour on 8 December 1941, in what became known as The Battle of Hong Kong. The Japanese occupied Hong Kong for the next three years and eight months. 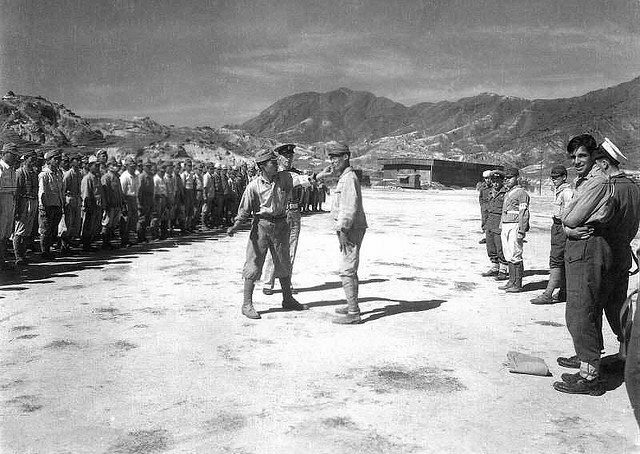 Image: Japanese surrender at Kai Tak, in 1945 via Flickr. The Japanese army pillaged and demolished Sung Wong Toi, Lung Tsun Stone Bridge, and the wall of Kowloon Walled City to provide building materials for the expansion of Hong Kong’s Kai Tak airport. Prisoners of war were used to construct the expansion. 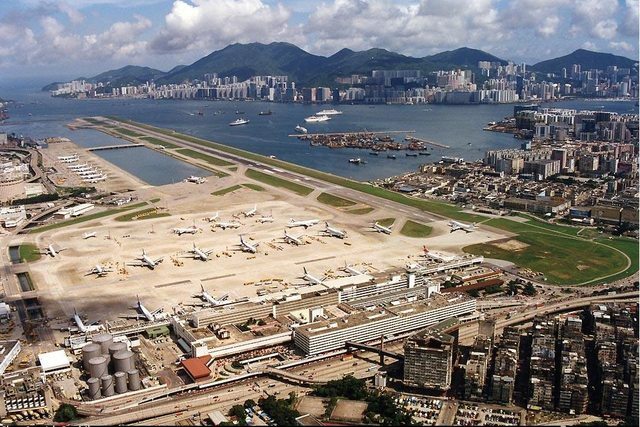 The old Kai Tak airport. Image: Daryl Chapman via flickr. Following the Japanese surrender, the derelict site became a haven for refugees and squatters. With ‘squatter rights’, a lack of space and increasing housing demand, 300 high rises were built on the 2.6-hectare site. The buildings became interconnected through dense networks of unplanned infrastructure. The city soon became a liability. Kowloon Walled City was never properly planned and without basic services, many of the inhabitants retrieved their water from wells, and rubbish was stored on the rooftops, which were also the only place residents could take in sun, open air and seek refuge from the buildings. By the late 20th Century Kowloon Walled City became a diplomatic crisis, with neither Britain nor China wanting to take responsibility for it. Despite many protests by residents of the Walled City, China and Britain spent over $2.7 billion Hong Kong dollars between 1991 to 1992 in compensation and for demolition of the city. Today, the Kowloon Walled City is a Chinese-style garden acknowledging the past darkness that once overshadowed that same space.